Aortic Aneurysm……Risk of Rupture……Open Heart Surgery….Sooner than Later. We sat there staring straight ahead, hearing words that our brains could not process; our denial making us numb. This isn’t possible. Not Rick, the strong foundation upon whom our family is built, whose boots track granite dust throughout our house and whose very name my phone auto-corrects to Rock. We expected some heart-related-issues based on family history, but not this. Slowly, as the news sunk in, there came a gradual realization of how lucky we are to have caught this in time and our disbelief turned to a overwhelming sense of gratitude that left us weak in the knees. Then, a mad scramble of second, third and fourth opinions, doctors appointments and so-many-tests. Weeks passed and we now have a plan and a team: a kind and skilled surgeon, a fabulous hospital, and a tribe of friends and family to surround us in prayer, support and encouragement. We are humbled at God's grace and the kindness of our friends and family. December 13, 2017. Once the details were taken care of, I was left with an intensely burning and consuming desire to look this straight in the eye and make it squirm. For weeks, my body was tense with determination. I would fix this for my precious husband through sheer will. It would not win. It would not scare me. I would stare it straight in the face and show no fear. I was on high alert. I barely slept and when I did, I woke with jaws clenched and fists curled tight- ready to swing. It was exhausting and a tad silly... Cue music and a close up of Katniss Everdeen. Last weekend a surprise snow storm visited us and dumped just enough snow on the ground to make it pretty without causing too much trouble. Rick and I took the dogs for a walk as the sun was beginning to shine. It was glorious, and the Holy in nature began to speak to me. Steady Chris, she said. See these broken tree branches. Their stubbornness and unwillingness to yield is what caused them to snap. Soften your heart and your shoulders, Chris. Release your fists. Relax. Breathe. Be fiercely strong but don’t rely solely on your own strength. Steady Chris, she whispered. 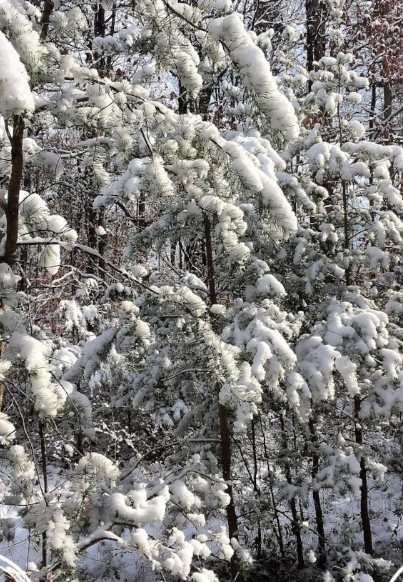 See the Evergreen bowing under the weight of the unexpected snow. See how she bends but does not break; how she holds herself strong yet remains flexible. Yield, Chris, to this unexpected burden, accept it for what it is and let it sit until the sun comes out. Bow deeply and you will not break. Steady Chris, she murmured. 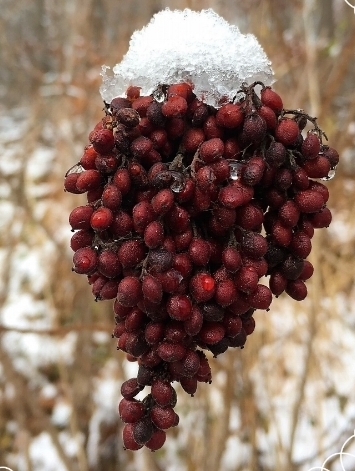 Notice these beautiful red berries covered in snow. You’ve walked past them every day this Autumn and never saw them. It is only now in the midst of this storm, that you are seeing their beauty. As you help Rick walk this long journey to restored health, look for the beautiful, my friend. It’s there. I promise. Steady Chris, she pleaded. 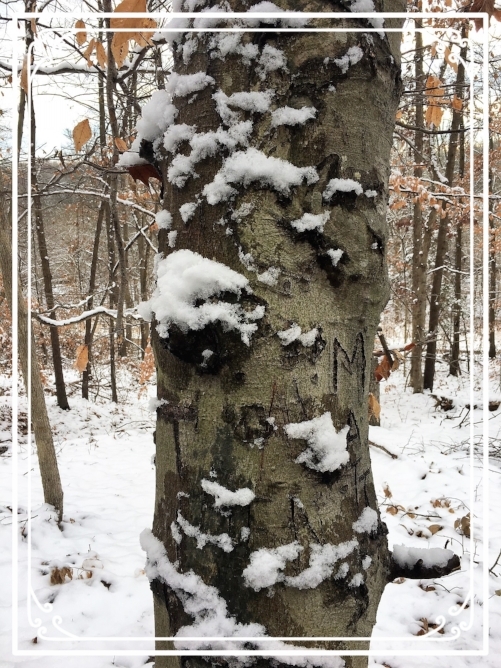 See this stump, this carved tree… These are your faithful friends that you pass every day. Your constants. Let them support you and show you kindness. Rest in their presence, Chris, and share your fearful heart. You and Rick are not meant to do this alone. And finally, she whispered. Softness and strength. Gentle and Fierce. Granite and Velvet. Ah, Mother Nature. You are a wise and faithful teacher. This vision of trees bending in the storm was first introduced to me by my dear friend Kelly Johnson in her book Being Brave: A 40 Day Journey to the Life God Dreams for you. I am incredibly grateful for the image. Thank you, Kelly.